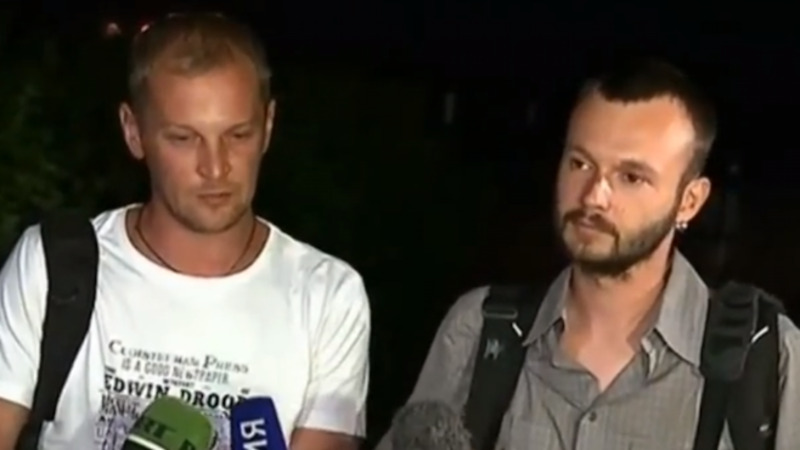 Detained cameraman Andrei Sushenkov and video engineer Anton Malyshev from Zvezda television released in Ukraine. Ukraine's Security Service has released two Russian television journalists who were held over the weekend for supposedly conducting "surveillance" of a Ukrainian border checkpoint, their employer said. Cameraman Andrei Sushenkov and video engineer Anton Malyshev from Zvezda television landed early Monday morning at Moscow's military airport Chkalovsky, where they had been brought by a Russian Defense Ministry plane after Ukrainian authorities handed them over to Russia, the television channel reported. Responding to questions about how the pair had been treated by Ukrainian authorities, Malyshev said they were "not exactly tortured," but were kept in a stuffy room overheated by the sun, and "slapped around on the subject of whether we work for any kind of secret services." “We were hungry, it was hot, dirty and sometimes painful,” the journalists were quoted as saying. The Ukrainian Security Service said the two men were detained Friday on suspicion of conducting "surveillance" of a border checkpoint in eastern Ukraine, Zvezda reported. The Russian Foreign Ministry had demanded their release and accused Ukrainian authorities of "flagrantly violating the freedom of the media." Since the outbreak of the Ukrainian crisis, both Ukrainian authorities and pro-Russian separatists have been accused of interfering with coverage of the conflict.